You Can Never Have Enough Pretty! Here's another of our cards from the Cocoa Beach Library Stamping Crew. Such a fun and capable group of gals! They are so kind and helpful to new students! No wonder that I love what I do!! 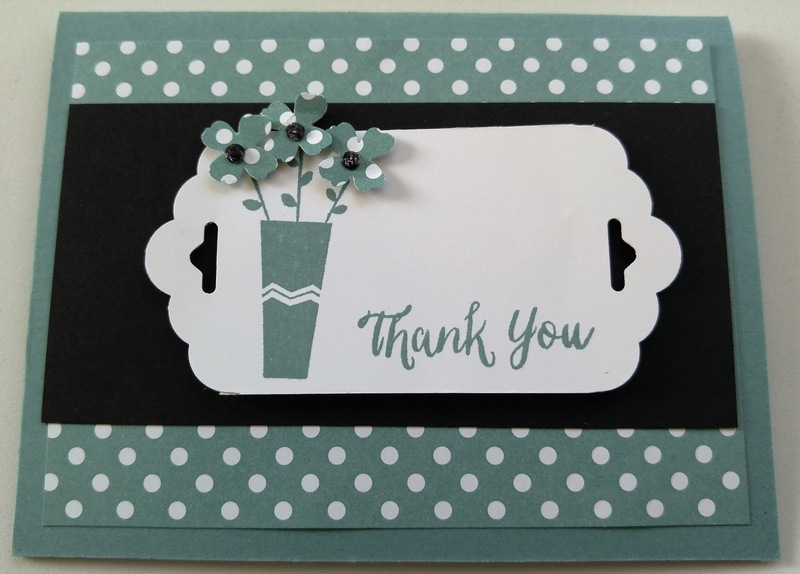 I love the clean simplicity of the Whisper White on Basic Black and the In-Color DSP was perfect with Lost Lagoon perfect polka dots! I'm sure you recognize the Scalloped Tag Punch Cuts and the flower punch from the Itty Bitty Accent punches. Quick Tip!!! Need black rhinestones for the centers of your flowers? Just grab your permanent black Sharpie and you'll have as many as you need in no time!! I hope you've found some inspiration for your stamping!! Card Making Inspiration From a Friend! This Week's Card Making Class Creations! More Holiday Dinner SOS Card Making Swaps!